Place all the ingredients apart from the dill in the blender and blend well until creamy cheesy mixture forms. Add the dill and stir with a spoon. Use it as a dip or creamy pasta sauce. 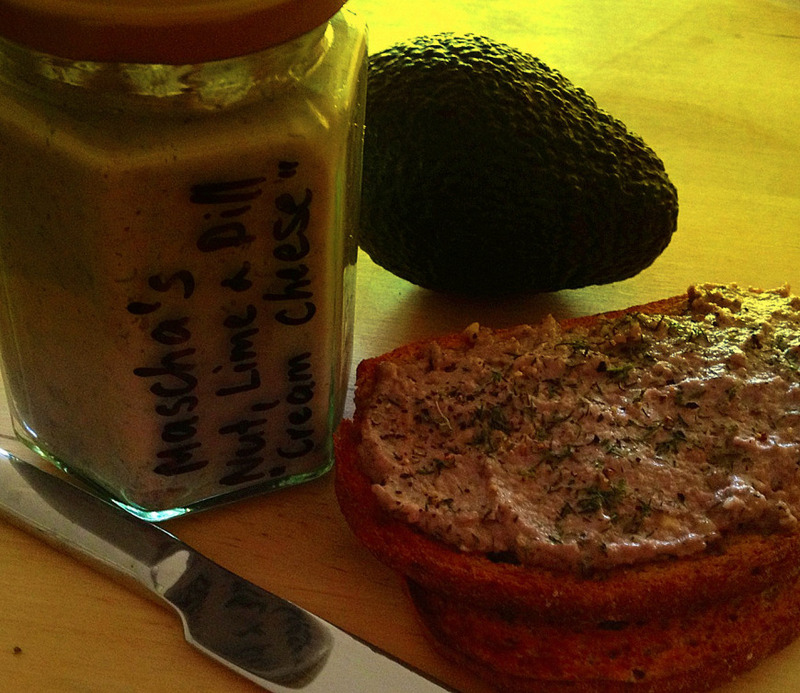 Or serve on a wholegrain or gluten-free toast. salt (to taste) – I do not add any salt to the mash, as I serve it on top of the scramble which has enough saltiness from the soy based tamari sauce. Grate the carrots and zucchinis into a large mixing bowl. Use your hands to crumble the tofu into the consistency of ‘scrambled eggs’ into the bowl. Mix the carrots, zucchinis, tofu, dill, chopped coriander, chilli (if using) and tamari sauce in the bowl and set aside for about 10 minutes to marinate. Heat the oil in the pan, add the sliced onion and sauté until translucent. Add the vegetable and tofu mixture to the pan, cover and cook for further 6-7 minutes over medium heat stirring occasionally. To make pea mash, add the frozen peas into a saucepan with boiling water, cover and boil for 4 minutes over the medium heat. Drain the peas and transfer them into a food processor. Add the mint leaves, lime juice and coconut oil and process until the mixture forms soft mash. Yum! 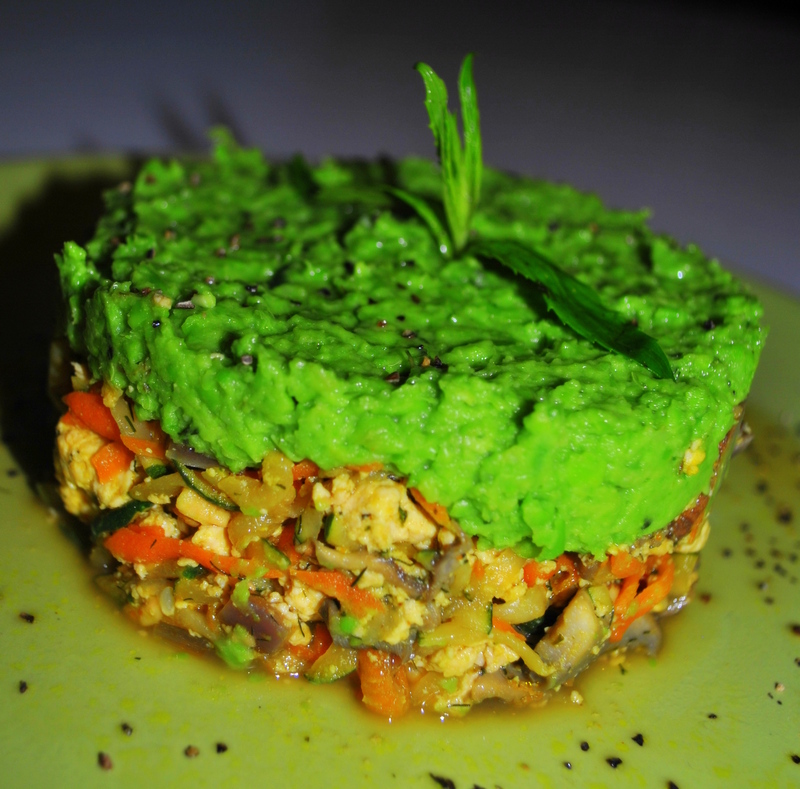 Serve the pea mash over the vegetable and tofu scramble! Easy-PEAsy, highly nutritious, fast and delicious! Using spiraliser, spiralise the zucchinis into a big bowl. 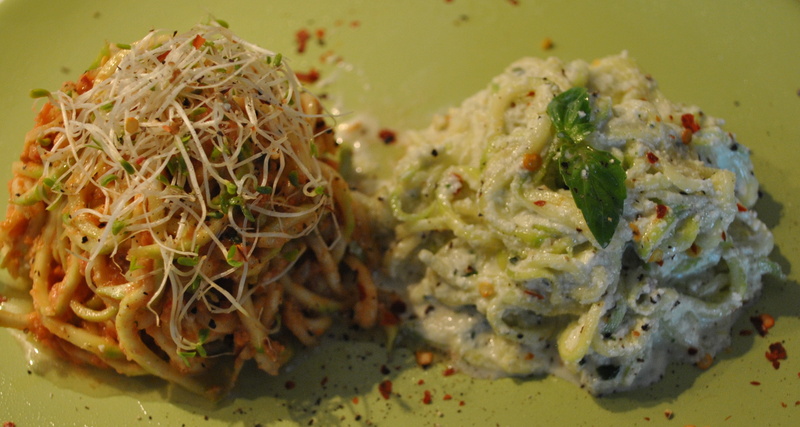 If you do not have a spiraliser, use a vegetable peeler to shave zucchini into long strips. Toss the Zpagetti (spiralised zucchinis) with chopped basil leave, salt, olive oil and lime juice (if using) and set aside to marinate for around 5-10 minutes while you prepare the sauces. Make the Creamy Sauce by putting its all ingredient in the blender and processing until smooth creamy texture is reached. Make the Marinara Sauce by placing all its ingredients in the blender and processing until you reach chunky consistency of the traditional Italian marinara. Pour any access liquid off the Zpaghetti and divide them into two separate bowls. Add the creamy sauce into one bowl and mix the Zpaghetti with the sauce until coated evenly. Add the marinara sauce into the other bowl and gently toss. Now the Zpaghetti is ready to be served. Arrange the Zpaghetti into two separate servings (one with the creamy sauce and the other with the marinara) on the plate and serve. Note: both Creamy and Marinara sauce can be used as delicious and nutritious dips. Process the ginger and garlic in the blender and place aside. Heat the oil in a large pan (or pot) over the medium heat. Add the sliced onions and cook for 4-5 minutes until soft. Add the ginger and garlic mix and cook for another minute. Add the spice mix and the water and stir for about 1 minute. 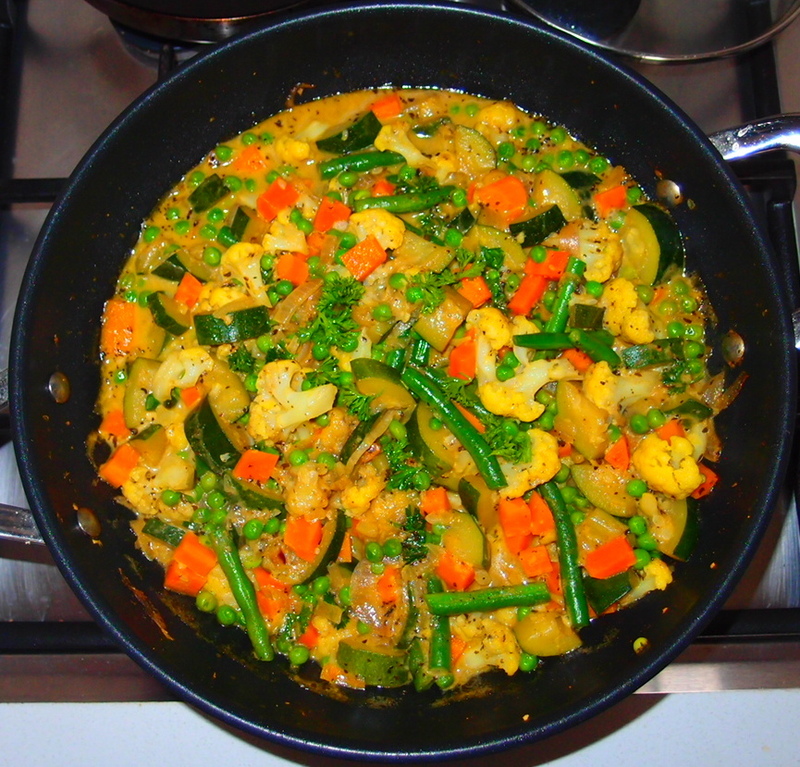 Add the carrots, zucchini and cauliflower, cover the pan and cook for 7-8 minutes over the medium heat stirring frequently. Pour in the coconut milk and maple syrup. Add the beans and the frozen peas. Stir the vegetables together and cook for another 4-5 minutes. Garnish with parsley or coriander leaves and serve over steamed brown rice.